Guitarist Kenny Burrell was born on July 31, 1931, in Detroit Michigan. When he was 12 years old he began playing guitar. He had no formal guitar training until later on, although his father played both ukulele and banjo. His mother sang in a church choir, and his brothers played also. Since 1996 he has been the Director of UCLA’s Jazz Studies Program. In his spare time he has played with Pepper Adams, Tommy Flanagan, Dizzy Gillespie, Milt Jackson, Elvin Jones, Percy Heath, Stanley Turrentine, Jimmy Smith, Donald Byrd, Oscar Peterson… The list goes on and on. The Kenny Burrell album I want to discuss here is the classic 1958 recording, “Kenny Burrell With John Coltrane”. This album was recorded on March 7, 1958 in Rudy Van Gelder’s studio in Hackensack, NJ. My CD is the digital remaster done by Kirk Felton at Fantasy Studios in 1987. 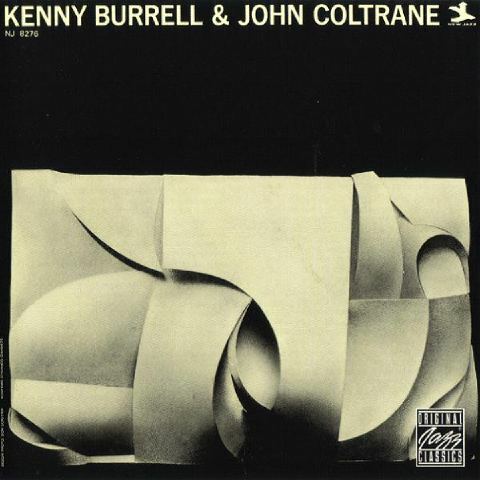 Burrell had only been in New York for a few years at the time of this recording, and many writers have chosen to concentrate on Coltrane and this album’s place in his musical development, rather than Burrell. Both were young musicians, still working to find their groove. Perhaps the focus has been on Coltrane because he died at a comparatively young age. As a fan of Coltrane, I truly enjoy his contribution to this album. Unfortunately, due to its very nature, a saxophone dominates any musical conversation it takes part in, forcing the other players to the background, even when one of those is the leader. The album is graced with two compositions by Tommy Flanagan, and the opening number, “Freight Trane” is one of them. The entire group gets the song off to a rousing start. Half a minute in, Coltrane steps forward and takes the lead with a masterful solo, while Chambers’ bass and Cobb’s drums set a blistering pace. We are almost two minutes into this seven minute-plus song when Burrell takes the limelight. He is followed by Flanagan on piano and then Chambers makes use of a bow on his bass, lending quite a different sort of feel to the song. Burrell and Coltrane share the ending minute or so. Here is “Freight Trane” done as a YouTube video. Note that there is no real video, just a reproduction of the album cover. The music is the thing here. Track two is the wonderful “I Never Knew”, written by Ted Fio Rito and Gus Kahn. Yes, I know what you’re thinking. I never heard of either one of them either. You should look up their bios online. Both men had fascinating careers, of which “I Never Knew” was only one small part. This one launches with Flanagan and Cobb, followed seconds later by Burrell and we’re off and running. Coltrane steps up a couple of minutes later, and the song seems to immediately change. It’s not too long however before Flanagan re-emerges from obscurity, and he is followed by Chambers, once again plucking rather than bowing his bass. Then we are treated to Burrell once again. “Lyresto” is the only song on this album written by Kenny Burrell. It’s a lively number in which the entire group gets a chance to shine. Burrell himself dominates the piece, which is, of course, only as it should be. Solo after solo, the infectious happiness of this piece never lets up. A lot has been written elsewhere about “Why Was I Born?”, composed by Oscar Hammerstein and Joel Kern. I’ll just say it’s a quiet, wistful tune that seems to perfectly mirror the sadly introspective question that forms its title. The album ends with “Big Paul”, the second Tommy Flanagan song here. It runs a little over 14 minutes and is the longest song on this disk. It begins quietly with Cobb’s drums and Chambers’ bass, followed by the writer himself tinkling the ivories. The guys lay down a slowly burning groove and are quickly joined by Flanagan. For quite a while we could be listening to a piano trio made up of piano, drums and bass. About four minutes in Trane steps up and takes over the piece for a while. His blowing is truly inspired, but then it occurs to you that we are hearing everyone except Burrell. After another four minutes Burrell’s beautiful guitar takes the center spotlight. He is followed all too-quickly by Chambers on the bass, and for a quiet moment we hear only the bass and Cobb’s brushwork, until Flanagan resurfaces and takes us to the end. “Kenny Burrell With John Coltrane” is one of my favorite jazz albums. I think you’ll find that it will make an excellent addition to your personal playlist for a Saturday, or any other night! Or you can visit ClassicJazzGuitars.com and read his bio there http://classicjazzguitar.com/artists/artists_page.jsp?artist=57. Additionally, his music is available for purchase at all the usual legal outlets.